• May 14 – Barnes & Noble at Citicorp Bldg, 160 E. 54th St, NY, NY. 12:30 p.m.
• May 14 – Bookends at 232 E. Ridgewood Ave, Ridgewood, NJ. 7 p.m.
• May 22 – Barnes & Noble at Farmer’s Market, 189 Grove Dr, Los Angeles, CA. 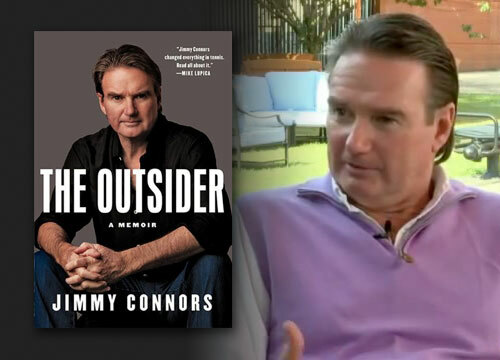 7 p.m.
Jimmy Connors releases his new autobiography titled “The Outsider.” Through the book, Connors decides to finally let the public into the private world he created on and off of the tennis court..
Connors, a former number one ranked tennis player, won eight Grand Slam singles titles and two Grand Slam doubles titles – Australian Open (1974), French Open (1979, 1980, 1984, 1985), Wimbledon (1974, 1982) and US Open (1974, 1976, 1978, 1982, 1983). He held the top ranking for a then-record 160 consecutive weeks from July 29, 1974 to August 22, 1977 and an additional eight times during his career for a total of 268 weeks. Connors largely disappeared from the public spotlight after his retirement while others such as John McEnroe remained highly visible. As a result, his autobiography is highly anticipated and promises to receive a lot of attention. Don’t be surprised to find it on the New York Times bestseller list. Jimmy Connors is also a dynamic motivational speaker and is one of our more popular athlete speakers says Sports Speakers 360. If you would like to book tennis stars like Jimmy Connors for a speaking engagement, autograph signing, VIP meet and greet, charity fundraiser, guest appearance, social media campaign or special event, you can request Jimmy Connors speaker & Jimmy Connors agent info or call 855.303.5450.